The Cape Breton Screaming Eagles tried all they could to get No. 1 overall pick Nicolas Roy to report to Sydney, and they finally washed their hands of the youngster. The Screaming Eagles dealt Roy to the Chicoutimi Saguenéens Thursday for Chicoutimi’s first round picks in the next three drafts: 2014, 2015 and 2016. As well, with the trade, the Screaming Eagles will receive a first round pick in the fifth slot for the 2014 draft as compensation for Roy’s no-show. Stéphane Leroux of RDS reported that Roy will report to Chicoutimi in the next few days, confirming that he would report to any Quebec team. The Sags beat out the Rouyn-Noranda Huskies, the Shawinigan Cataractes and the Gatineau Olympiques for Roy’s services, Leroux reported Thursday. Roy will join a well-rounded Chicoutimi team-in-transition. Standout captain and last year’s leading scorer Charles Hudon, last year’s surprise Laurent Dauphin, Sebastien Sylvestre and the recently acquired overager Victor Provencher round out the forward corps. With Roy, defencemen Loïk Léveillé and Nikita Liamkin and goaltender Julio Billia, the Sagueneens’ future looks bright. 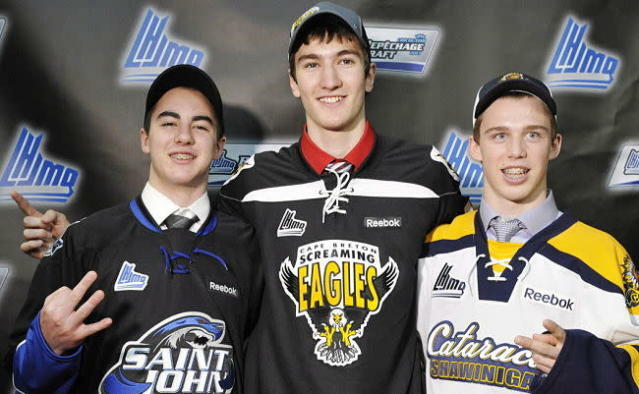 The Screaming Eagles wanted to use Roy as the centrepiece for their rebuild, but now have three extra first rounders to help bolster their young lineup for the 2013-14 season. Roy’s trade gives pause to revis up the last biggest trade for a first overall pick who refused to report to his team. In 2011, the Baie-Comeau Drakkar traded super prospect Nathan MacKinnon to the Halifax Mooseheads for three first round picks, Halifax’s in 2012 and 2013 and Quebec’s in 2013, and two players, Françis Turbide and Carl Gélinas. Halifax traded Adam Erne to Quebec for three first round picks, in 2012, 2013 and 2014, and used that pick in the MacKinnon deal. Gélinas and Turbide helped the Drakkar boost their rebuild to propel the team to the league finals last season. Baie-Comeau picked defenceman Alexis Vanier in the 2012 draft, and picked Nicolas Meloche with Quebec’s pick in 2013. Baie-Comeau traded Halifax’s 2013 pick to Gatineau, then to the Val-d’Or Foreurs before the Charlottetown Islanders selected forward Alexandre Goulet. While it remains to be seen if Roy can live up to the MacKinnon hype; he isn’t projected to be; but he will be forever remembered in Cape Breton and Chicoutimi for his high price before he even played a game. Roy will be in action at the Centre Georges-Vézina against the Quebec Remparts in the Saguenéens season opener on Sept. 13.